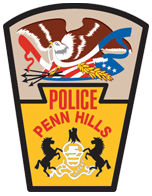 The Penn Hills Police Department was established in 1927, though the Municipality of Penn Hills was called Penn Township at that time. The department consisted of just one police officer, Samuel Bickerstaff, who patrolled the township on a motorcycle, which mainly included farm lanes and smaller roadways. Officer Bickerstaff, who eventually became the first police chief, was on-call to handle any issues that arose. The population at the time was just over 5,000 people. The police department was housed in what is considered the original municipal building, at 12245 Frankstown Road. In 1932 the police department added a part-time police officer to aid with police protection. He used his vehicle at the time. The police department added its second full-time officer in 1937, as there were now more than 10,000 residents residing in the community. By 1941 the police force doubled to four full-time police officers, and the population continued to grow. The department utilized one police vehicle that was equipped with a radio receiver and shared communications on the Pittsburgh Police radio band. 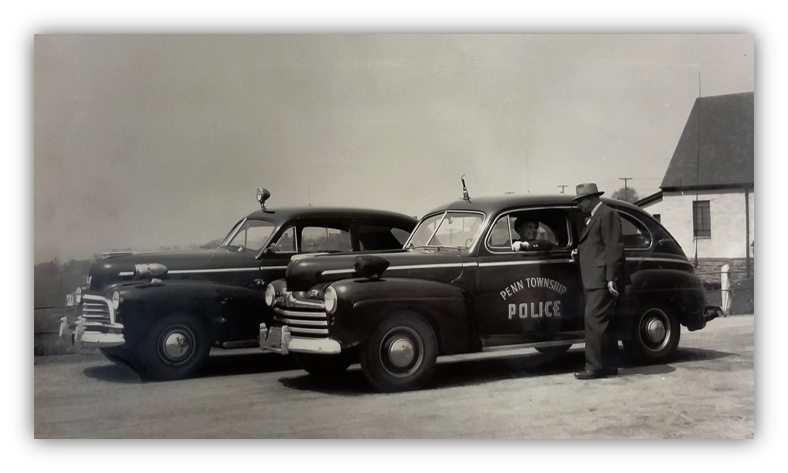 The township passed an ordinance in 1941 that created a civil service commission to adequately screen and hire police officers, setting in place specific standards for police applicants. The civil service procedure is still used to hire and promote officers. As the population continued to grow, so did the police department. In 1954 twelve police officers were working in a department that provided policing services to over 35,000 residents. It was during this period that things began to change drastically. The population was swelling, there were now far more roadways to patrol, and shopping centers, recreational facilities, and new housing plans added to the increasing volume of police calls. A change was inevitable. In 1958 the Township of Penn officially became Penn Hills Township, with a population exceeding 40,000 people. 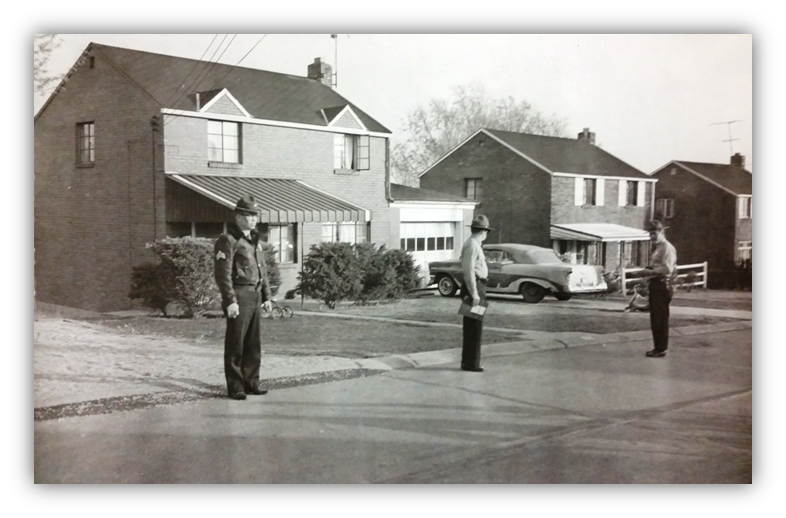 The Penn Hills Police Department continued to grow, expanding to nearly forty police officers by 1963. The department provided 24-hour police protection to the community. 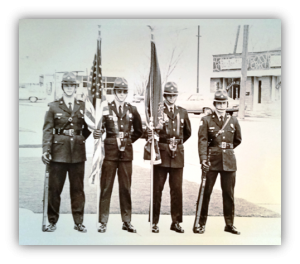 There was also a creation of a rank structure during this era, adding lieutenants, sergeants, and detectives, in addition to the patrol officers. The police department eventually acquired a two-way radio station, placing radio sets in every police vehicle. More vehicles were added to the fleet, which included ambulances equipped with stretchers and first-aid equipment. Police officers drove the ambulances until the creation of the Penn Hills Emergency Medical Services division in 1974. 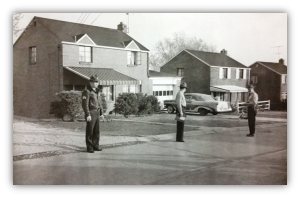 In 1966 the Penn Hills Police Department was operating with forty-four sworn officers, to include the chief of police. The township’s population had climbed to nearly 60,000 people. A newly appointed patrol officer made $4,699.44 per year, with the chief of police earning $8,678.76 annually. On February 28, 1969, the police department moved into a brand new building designed to accommodate up to ninety officers. The new building connected to the original municipal building built decades earlier. There were fifty-three full-time police officers employed in 1969. The department had thirteen vehicles. There were more than 60,000 residents, and the department was handling more than 10,000 calls for service each year. Penn Hills Township became known as the Municipality of Penn Hills in 1973, after adopting a Home Rule Charter status. This change did not have a significant impact on the police department. The police department added a new division in 1977, forming the Canine Division. The unit started with four canine teams. The department has maintained this unit over the years and has consistently budgeted for a contingent of four police service dogs, making it one of the largest in Allegheny County, outside of the Pittsburgh Bureau of Police. In 1978 the department created the Traffic Division. Five officers were initially assigned to the unit. As the roadways throughout the municipality became busier with traffic, it was clear that there was a need for this specialized division. Very few changes took place in the police department over the next decade. The divisions within the department remained the same; however, calls for service did gradually increase. There were fifty-six officers actively employed by 1989, and over twenty vehicles maintained in the fleet. The next ten years saw a great deal of change in technology, as the world began to brace for the new millennium. As such, policing, in general, began to change with the times, with an emphasis placed on technological advances. The police department made a shift from maintaining records in paper format, to storing reports and files in a computer database. Also, Mobile Data Terminals were installed in marked police vehicles during the mid-1990s. In 1998 there were fifty-five police officers employed with the Penn Hills Police Department. The Penn Hills Police Department eventually transitioned from operating its dispatching system to using the services of the Allegheny County Emergency Services 911 Center in 2005. By now, many police departments had also transitioned to the county service, as the technological capabilities of their center were state-of-the-art, and there was no cost, saving many local governments a substantial amount of money. On July 19, 2018, the police department shifted its operations into a brand new municipal complex, located at 102 Duff Road. The new facility incorporates many modern features commonly required of professional law enforcement agencies of similar size and will serve as the home for the department for many decades to come. At present, the Penn Hills Police Department budgets for fifty-three police officers, not including the chief of police. The department handles nearly 25,000 calls for service annually, serving approximately 45,000 residents. There are over twenty-five vehicles in the police department fleet. From its inception, there have been five distinct shoulder patches worn by officers of the Penn Hills Police Department. Patches were not worn on the official uniform when the police department was founded. Officers only wore a badge. The current shoulder patch has been in service for several decades and features a unique design that incorporates the famous Pennsylvania Keystone, a bald eagle atop of our nation’s colors, the coat of arms of the Commonwealth of Pennsylvania, and the traditional colors of Penn Hills. Samuel Bickerstaff, the department’s first police officer, was also the first chief of police in the department’s history. Since his appointment to that role, there have been four other department heads, to include three more police chiefs and a captain in charge of the police department. In 1995 Lieutenant Howard Burton was the officer in charge of the police department. He was appointed to Chief of Police in 1999 and is the current chief of police. Since its creation in 1927, there have been many notable changes in the history of the Penn Hills Police Department. What began as one police officer riding a motorcycle, has evolved into a police force of more than fifty highly trained officers, working within several divisions to offer an uncompromised level of policing services to the residents and visitors of the Municipality of Penn Hills.